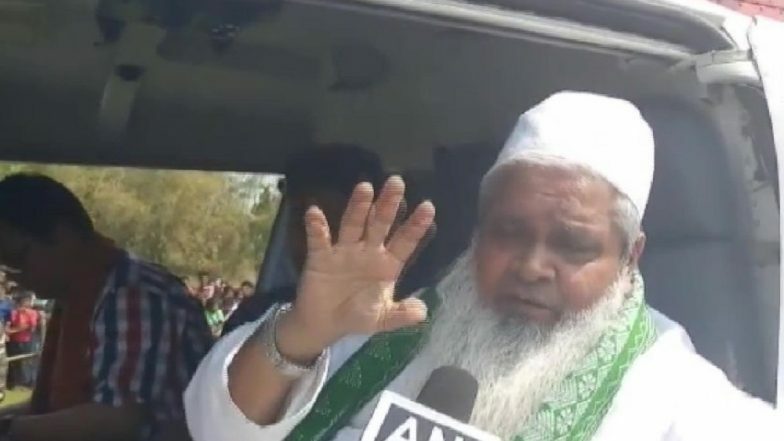 Guwahati, April 13: All India United Democratic Front (AIUDF) president, Badruddin Ajmal on Friday, sparked controversy for his comments on Prime Minister Narendra Modi. While speaking to news agency ANI in Assam’s Chirang district, Ajmal said that his party is part of the grand alliance which will defeat PM Modi in the Lok Sabha elections 2019 and will throw him out of the country. The AIUDF president further added that the PM would thereafter open a tea shop somewhere, and would also sell pakodas. Ajmal’s comments came on the day, when the Bharatiya Janata Party (BJP) moved the Supreme Court against Congress president Rahul Gandhi for using 'chowkidar chor hai' phrase against PM Modi over the Rafale deal. BJP MP Meenakshi Lekhi has filed the plea. A bench headed by Chief Justice of India (CJI) Ranjan Gogoi will hear the petition on April 15. In the plea, Lekhi said that Gandhi misquoted apex court’s December 14 ruling on the deal. Last year in December, the AIUDF chief was in headlines after he threatened and abused ETV Bharat’s journalist after he asked Ajmal if he would ally with Congress or BJP in the coming Lok Sabha elections of 2019. The incident took place during a press briefing at Hatsingimari in Assam’s South Salmara Mankachar district to felicitate the winning candidates of the party in the recently-held Panchayat polls. However, a day later, he apologised for his comments. Ajmal is an MP from Dhubri Lok Sabha constituency. He is also the president of the Assam State Jamiat Ulema-e-Hind.